Renewable, geothermal energy production from deep reservoirs relies on drilling boreholes of multiple kilometers in length. Drilling deep wells in abrasive and hard rock environments can result in increased wear for conventional rotary drilling methods. Source: http://www.ltr.ethz.ch/forschung/spallation_drilling.html The costs associated with borehole drilling for geothermal power plants represent up to 70% of the total project costs, which requires a reduction of trip time associated with drill head damage. Thermal spallation drilling promises reduced drill head wear and thereby significantly reduced drilling costs. Thermal spallation drilling utilizes crack nucleation in hard rocks, which originate due to thermal stresses introduced by a flame jet. The flame jet is lowered into the borehole and rapidly heats up the rock surface. Due to confining stresses in the rock mass, the grain expansion with increasing heat leads to the nucleation of cracks and eventually “spalls”, which leads to a fragmentation of the rock. This project develops a novel numerical approach to model the spallation process in a rock mass with given grain distribution properties. 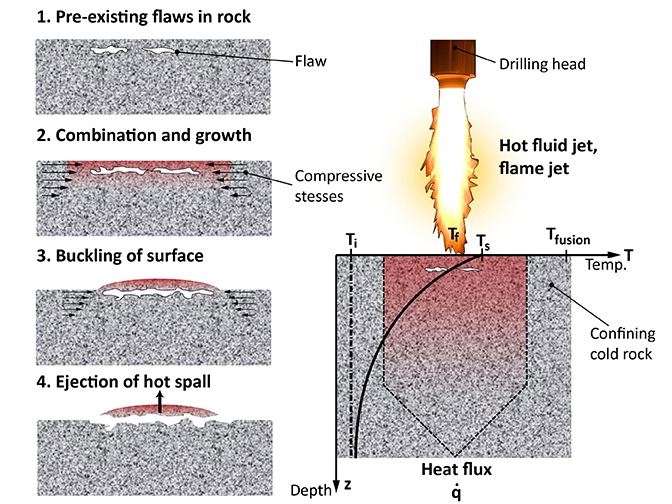 The numerical approach is then used to classify spallation properties and characteristics for different rocks and flame jet configurations and helps to further understanding about the underlying physical processes occurring during spalling.